Peter Hyams' fantastic directorial eye and superlative visual design make this obvious 'Alien' clone one of the more underrated, if not one of the best, science fiction films of the early '80s. Often referred to as 'High Noon' in space, Hyams, as writer and director, indeed borrowed heavily from the minimalist Western showdown films such as 'High Noon', but also from Budd Boetticher and most certainly the working class ‘trucker in space’ concept of Ridley Scott’s 'Alien'. Hyams’ thoroughly modern stylized visuals elevate this film above a mere copycat picture though. It's a riveting and beautiful-to-look-at sci-fi yarn. 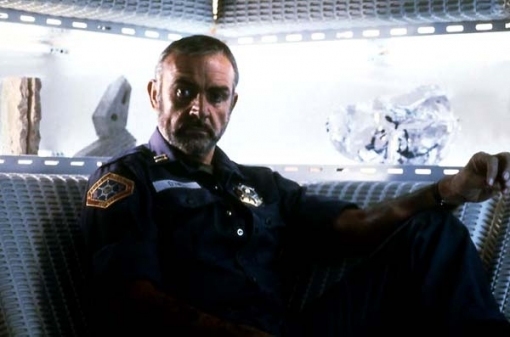 Sean Connery plays US Marshal William O’Neil, who is stationed for a one-year tour as chief policeman on the Io mining colony outside of Jupiter. He immediately butts heads with the station manager, Mark Sheppard (Boyle), who wants O’Neil to look the other way from the shady social discretions of his workers – namely rampant drug use and prostitution. But when a number of workers inexplicably commit suicide or take on aggressively violent tendencies, O’Neil steps in to find justice, thus pitting him against the big corporate interests of the mining company that feeds its employees dangerous amphetamines to get them to work more efficiently. The first two-thirds of the film build wonderfully to the final act, which fulfills the comparisons to High Noon, a taut homage to Gary Cooper’s dramatic confrontations with the three assassins en route in that film. Hyams’ builds up the tension of this fight not-so-subtly referring to the countdown to the arrival of the next passenger transport ship from earth. Armed with only a shotgun and his guile, and aided by the wily and inventive scientist played by Cheers’ Frances Sternhagen, Hyams’ crafts a terrific Western-style shootout in the bowels of the near-empty space ship. While the production design of the ship’s interior is indeed intricate in its details, Hyams is not content to lock his camera down and admire the view. He moves his camera elegantly through the space, in and out of corridors and across the stacks and stacks of living quarters, which resemble shelves at a big-box store. Hyams' lighting scheme using primarily visible light sources in the frame certainly doesn’t predate Ridley Scott’s look from Alien, but certainly influences the later work of David Fincher and other fluorescently lit trend films of the '90s. The result is part and parcel to the mood and tone of the film. Watch the inspired design of the space helmets for instance. Each character’s face is lit by a circle of lights inside the helmet, enhancing the drama of the story. Hyams was also one of the masters of the chase scene. He engineered a marvelous car chase in 1978’s Capricorn One. And despite being in the confines of a clunky tin can in space, Hyams choreographs an even more thrilling running chase through the base station. If anything, the optical effects show its wear and don’t rise to match the film’s bigger budget contemporaries such as Alien and Star Wars. But for good old fashioned production design, lighting and visceral sci-fi thrills Outland overachieves admirably. Outland is available on Blu-ray from Warner Home Entertainment.